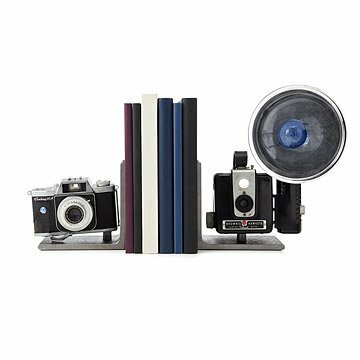 Frame your books with these shutterbug bookends made from vintage cameras. When a picture is worth a thousand words, bracketing your books with cameras makes perfect sense. Taking photographic decorating to a new level, these one-of-a-kind bookends have been sourced by artist Breck Armstrong from vintage cameras. While each set is unique, each includes one camera with the iconic flash bulb and one without. Handmade in Michigan. Due to the handmade nature of this item and its reclaimed materials no two sets wil be alike. Great gift for a camera buff or photography enthusiast!